The Musa genus is extremely diversified and currently divided into four identified sections (Callimusa, Australimusa, Eumusa, Rhodochlamys) and an undetermined fifth section. Most cultivated bananas arose from the Eumusa section which contains 11 wild species, including Musa acuminata (A genome) and Musa balbisiana (B genome), which gave the main cultivars. All modern varieties and cultivars are hybrids or polyploids of one, two or three Musa species. Diploids or triploids of Musa acuminata (AA or AAA) result in edible fruits (Cavendish dessert bananas) and are widespread in Southeast Asia. 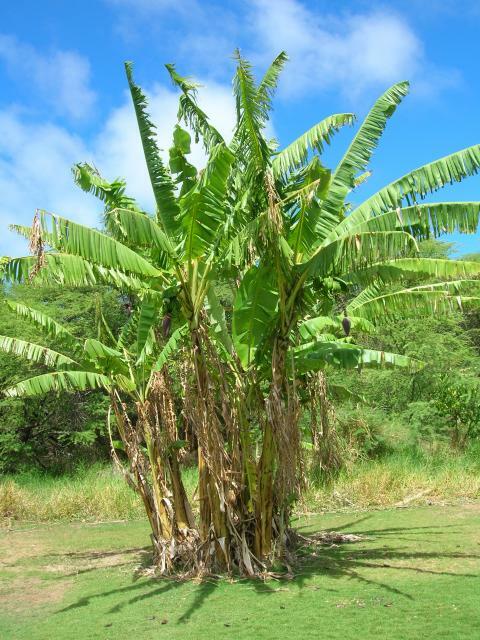 Natural hybridization of AA or AAA cultivars with Musa balbisiana resulted in new cultivars of AB, AAB (mainly plantains types) or ABB genome types. For further information on banana and plantain species, see Musalogue: a catalogue of Musa germplasm (Daniells et al., 2001). Banana (Musa sp.) is one of the major fruit crops, cultivated in all warm and humid tropical and subtropical regions of Asia, America, Africa and Australia. While bananas are primarily grown for food, 30-40% of the crop is considered unfit for human consumption and is potentially available for animal feeding. Banana peels and the vegetative parts of the plants are also used in animal feeding. The banana tree is the tallest herb in the world and can reach up to 9 m. The roots are rhizomatous and adventitious, most developing in the top 15 cm soil layer. Suckers arise from the rhizome. The stem (pseudostem) is cylindrical, made of overlapping leaf-sheaths, 20-50 cm diameter. The leaves are broad blades, 1-4 m long x 0.7-1 m wide, with a pronounced supporting midrib, and grow continuously from the center of the stem. The inflorescence (1 per tree) is horizontal or pendulous. Flowers are unisexual: female flowers develop proximally, male flowers developing at the distal end of the inflorescence. The inflorescence bears 5-15 nodes, each producing 12-20 female flowers. It develops into a 50-150 cm bunch where each node becomes a "hand" of fruits. Fruits may be 6-35 cm long, green, yellow, red or brown, cylindrical or angled, straight or curved, and seeded or seedless depending on the cultivars or landraces (Ecoport, 2010; Ecocrop, 2010; Espino et al., 1991). 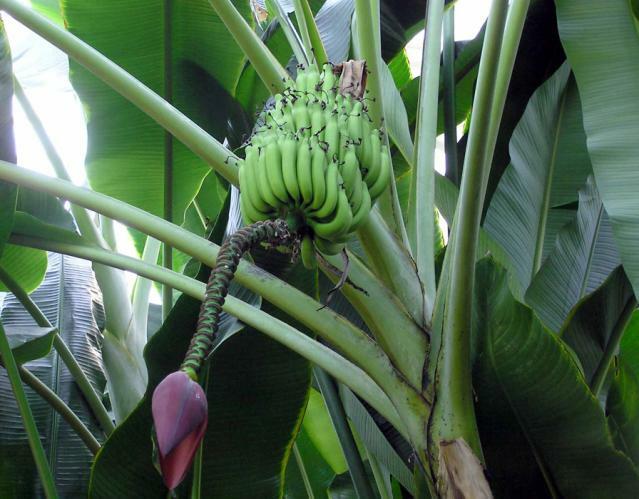 The banana plant usually blooms after 8-9 months and the fruits are harvested unripe 10 to 14 weeks after flowering. Yields are very variable, ranging from 3 to 60 t/ha, depending on genetics (variety/cultivar, ploidy) and culture conditions (Espino et al., 1991). Banana is usually grown for its edible fruits. World banana production was 102 million tons in 2010. Globally, it is one of the major fruits, ranking in economic importance after grapes, tomatoes and apples (FAO, 2012). Bananas used for cooking or making beer. They include plantains and other sub-groups of varieties such as Pisang Awak in Asia, and represent 44% of world banana production (Lassoudière, 2007; Arias et al., 2003). Most plantains belong to the AAB genome group (Lassoudière, 2007). The ripe fruit is eaten fresh as dessert or baked, fried, dried or roasted. It can also be processed into vinegar, chips, starch or beer. The underground stem and male flowers can be eaten as a vegetable (Espino et al., 1991). The leaves are used for wrapping food for cooking, making clothes and polishing floors. Ethno-medicinal uses of different parts of the banana are plentiful (Espino et al., 1991). Young stalks and leaves, wasted fruits and banana peels are fed to livestock (Ecocrop, 2010; Espino et al., 1991). Though its exact origin is still uncertain, the Eumusa group of the Musa genus is thought to have originated from the Indo-Malayan region. It spread eastward throughout Southeast Asia, the Philippines and the Pacific Islands (Espino et al., 1991) and westward to Africa, the Carribean and Central America (INRA, 2008; Daniells et al., 2001). It is now cultivated in all warm and humid tropical and subtropical regions of Asia, America, Africa and Australia. Bananas grow from sea level up to an altitude of 1600 m (Ecoport, 2010; Espino et al., 1991). Optimal growth conditions are 27°C-38°C day-temperatures with 200-220 mm monthly rainfall, on friable loam with good drainage and aeration. Soil pH ranging from 4.5 to 7.5 and soil moisture above 60% are ideal. 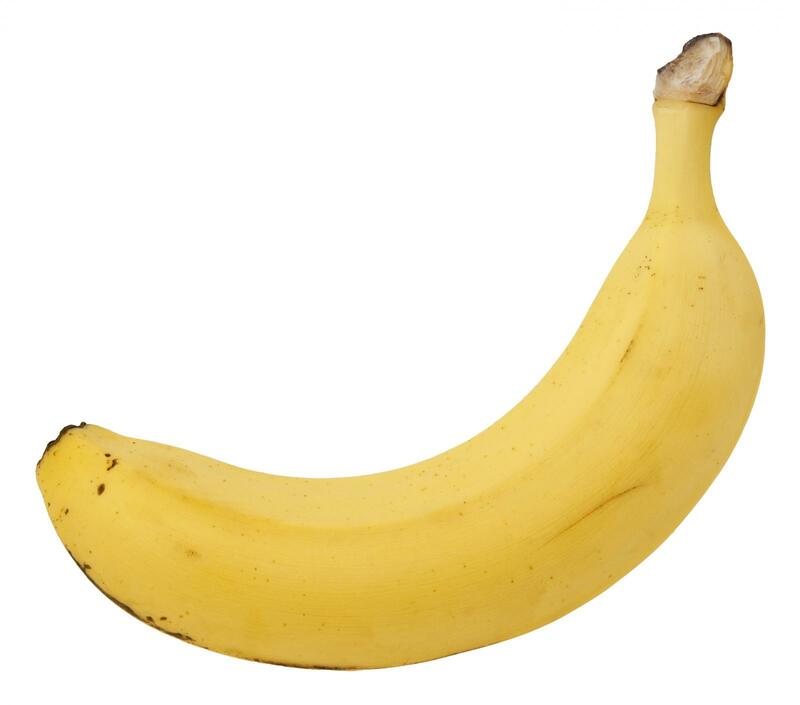 Banana does not stand temperatures below 15°C and chilling injuries occur at 13°C (though some varieties can tolerate 0°C). It is sensitive to wind, which shreds leaves and blows plants over (Espino et al., 1991). It has been estimated that 30% to 40% of total banana production are rejected for failing to meet quality standards, making them potentially available to livestock (Babatunde, 1992). Banana wastes include small-sized, damaged or rotten fruits, banana peels, leaves, stalks and pseudostems. There are many ways to feed livestock with banana products. Animals can be fed with fresh bananas, ripe or unripe, with or without peels. Fresh plantain and banana fruits may be ensiled with a wide range of crops and additives, including molasses, grass, legumes and rice bran. Green fruits are easier to ensile than ripe fruits. Bananas and plantains may also be dehydrated, chopped, milled or cooked, etc. (Babatunde, 1992). Dehydrated or fresh green and ripe peels are used as feeds (Babatunde, 1992). Whole, fresh leaves, stalks and pseudostems can be chopped and directly fed or ensiled with molasses (Babatunde, 1992). Industrial banana plantations are dedicated to export markets. They are intensive monocultures that require land, irrigation and high levels of fertilizer. These characteristics are deleterious to biodiversity, soil fertility and water quality. In South America, banana monocultures are responsible for deforestation, soil erosion, soil fertility losses and water pollution (Harari, 2005). As bananas are particularly susceptible to disease (Black Sigatoka: black leaf streak), nematodes (with subsequent viruses), pests (banana weevil) and fungi, they require high levels of pesticides and fungicides (Astorga, 1998), resulting in water contamination, fish mortality in waterways surrounding banana plantations, and health and fertility problems in workers (Harari, 2005). Conventional breeding programs and genetic engineering programs aim at creating fungi/pest/disease-resistant cultivars that do not require pesticides. Genetically modified bananas are currently under development but not yet on the market (as of 2012). In less industrial conditions, banana may be intercropped with legumes or other crops, thus enhancing land productivity and returns to smallholders. Intercropping may improve banana pests and disease control (Ouma, 2009). Tannins are the main antinutritional factor of bananas and are mostly contained in the peels. Ripening cause these tannins to disappear (or their transformation into inert forms). In addition to their antinutritional effects, particularly in monogastrics, banana tannins are supposed to be responsible for the astringent taste of immature fruits, making them less palatable than mature fruits (Ly, 2004). As commercially grown bananas are subject to heavy pesticide applications, feeding animals with banana fruits or stalks may result in pesticide residues in animal tissues. An Australian survey assessing 28 banana pesticides reported that carbaryl, chlorothalonil, dicofol and prochloraz could be responsible for residue violations in meat and edible offal (MacLachlan, 2006).